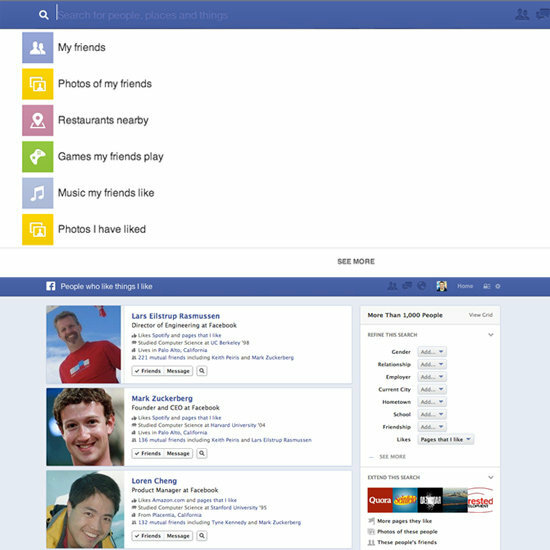 Many of us are still awaiting the full roll out of Facebook’s new graph search. Those who do have the new feature are watching it take shape and refine its abilities to formulate valuable search results as it learns more about the information we share. From a business perspective we are still waiting to see how profoundly graph search will impact us. And we continue to prepare by serving up as much optimized information as we can, as well as by continuing to post good value and foster lively engagement. These activities will allow the feature to access comprehensive details about our companies for good search result visibility. The next big change rolling out affects Facebook’s news feed. The platform has styled it more like a newsletter. The new feed will present stories in chronological order, with our favorites getting the top spots. It will be customizable via clickable links in the right side column. While the default view will be “all friends,” we will be able to use those links to focus on specific postings we desire to see. One of them is “following,” which will customize the feed to show stories from pages we have liked and groups we have joined. 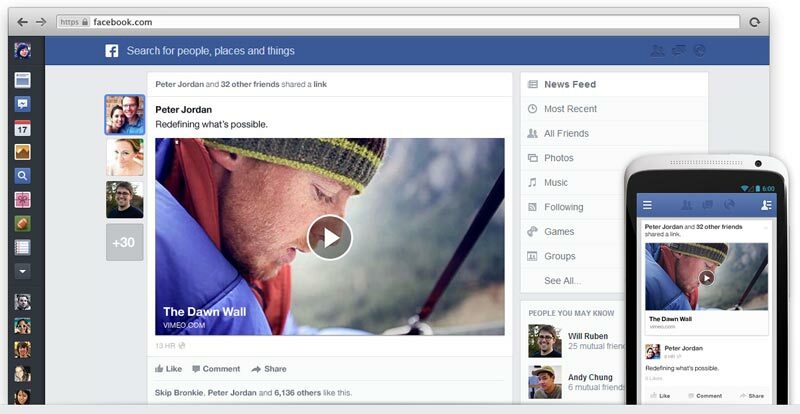 Facebook’s redesigned news feed will feature much larger, more eye catching visuals. Pictures and videos will present much bigger, as will the thumbnails that show when we converse or share links. 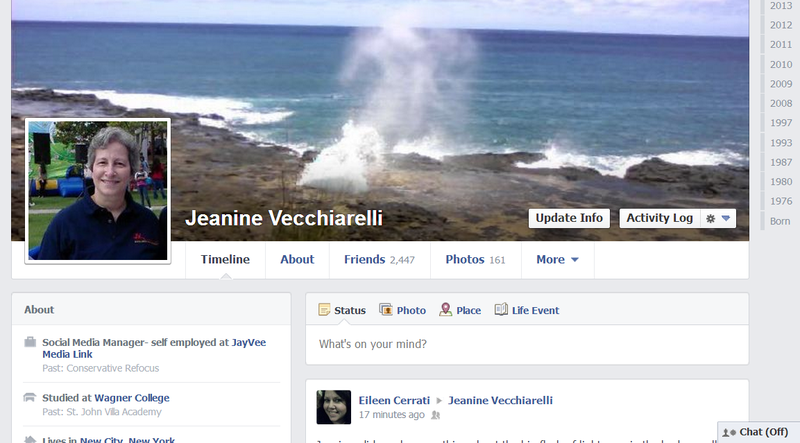 These changes will bring the desktop appearance into line with how the news feed looks on mobile devices. An interesting thought to ponder is how the new news feed will impact our businesses. Obviously, the larger graphics – including those contained in our ads – will be helpful. And now, when people “like” our pages a small graphic of our cover photos as well as our profile pictures will appear in their and their friends’ news feeds. But since the default will be “all friends,” will our other posts be denied access unless users deliberately click on the “following” choice for their feeds? This remains to be seen. I doubt Facebook will do anything to negatively impact our businesses, since they could risk losing our patronage AND our ad dollars. Things may be a bit bumpy until the changes settle in. But I’m sure plenty of tweaks will be made to ensure our businesses will be seen. In the mean time, it makes sense to continue doing the things we are doing to boost our chances of being found: having complete, optimized “about” sections with links to our websites and other social sites; lots of appealing visual posts; original and shared posts that contain excellent value for our followers; fostering and supporting good engagement on our pages. Facebook has FINALLY listened to its disgruntled user masses, and is returning to a single column timeline for our profile pages. This is a change that has been desired ever since the timeline format was introduced. Hopefully it will translate well onto our business pages as well. The actual timeline will now be on the right side of our profiles. The left column will contain an abbreviated look at our “about” information. Under the “about” section will be our friends, followed below by our pictures. If we use any specific apps, like Instagram, those would come next. The application icons that currently appear below our cover pictures will be replaced by simple text links. Overall, this looks to be a much cleaner, easier to use interface. Facebook has JUST changed the rules for business cover pictures. Previously, they could not contain contact information, calls to action, or direct ad copy such as promotional info. Now the only rule that still applies is the one put in place last January, limiting text on our cover photos to a maximum 20% of the surface area. This is a surprising move considering Facebook’s contention that they do not want our cover pictures to appear “spammy.” Perhaps their thinking is that advertising copy will be severely curtailed anyway by that 20% text limitation. On the topic of Facebook’s 20% text rule, many of us have been struggling to be sure our business cover pictures are in compliance. Until now we haven’t been able to do much more than take educated guesses. Happily, a new tool to take the guesswork out of the process is currently in beta. The Facebook Cover-Photo Compliance Tool allows us to upload our cover pics, which will then appear with a grid over them. Clicking the grid squares over text areas will tell us what percentage of our cover pictures contains text. Do note, though, that the tool is currently incapable of uploading cover photos for business pages that have limitations of any kind; e.g., age or location. Four additional changes in just under three months. Facebook is on the move! What do you think of the platform’s newest roll outs? Please share your thoughts in the comments section below! This entry was posted in Facebook, Facebook cover pictures, Graph Search, Social Media Management/Marketing, Timeline and tagged cover picture, Facebook, graph search, Jeanine, Social Media Management/Marketing, Timeline, Vecchiarelli by Jeanine Vecchiarelli. Bookmark the permalink. Thank you so very much for your post. It was very informative and I appreciate it. I always appreciate your posts. Have a great week !!! Believe it or not, since this post published Facebook has rolled out another new feature or two. I would amend this post, but it’s already long enough. 1. We now have the ability to respond directly to a particular comment in our comment streams. We need only enable the feature in the admin panel of our business pages. If an option box doesn’t automatically pop up, we can go to “edit page,” then “manage permissions” to enable. And 2. I mentioned in our post that a small version of our business cover pictures and our profile pics are published in the news feeds of those who have newly liked our pages and of their friends. Even better, Facebook gives the readers of that information the ability to “like” our business pages themselves right from there by adding a “like this page” option at the end of the news feed entry! Thanks for sharing the information. I do like the new Timeline format. I have been getting a lot of requests from friends to take them off the part where anyone can view pictures of them and their families. I’m not so sure that is new, but it seems to be making people nervous. There is just so much information that people put on facebook, perhaps it’s time people take control of their own privacy. If you don’t want it viewed,,..well don’t post it. Facebook can be fun, but, let’s face it, they are not exactly protecting our privacy. You are absolutely correct about the privacy concerns, Sandra. While Facebook’s grand pubahs assure that they allow us every opportunity to control the privacy of our posts, the platform makes its money in large part by targeting ads to the preferences of its users – based on….you got it…the personal information they provide. This is especially the case with the new Graph Search feature that is still being rolled out. Graph Search can’t work effectively if it can’t access our personal preferences via reading them and our posts. Of course, if we set these things to private the tool won’t breach our settings. The grand pubahs are counting on collecting the information their tool needs to assimilate from the millions of users who don’t properly set their privacy controls. We ALL need to take the time to review and if necessary refine those privacy settings if we desire to keep our information from more public viewing. And of course, the safest route is to not post anything we don’t want even POTENTIALLY shared. Bottom line: there’s no such thing as total privacy on the worldwide web.